Awhile ago a wrote a post regarding whether or not RSI looked like a meaningful indicator. After writing that, I decided to do an experiment to see if I could come up with a strategy based on the relative strength index (RSI) of a stock. First off, there are many ways to calculate RSI – short term, long term mid term, but I decided to look at the short term 10 day moving average RSI – for now particular reason other than I had that data available. The strategy I used was when a stock goes above 70 on the RSI sell a call or buy a put with the assumption that it is likely to perform poorly going forward, and when the RSI falls below 30 buy a call assuming it will outperform the market going forward. I set up a process that each week, my stock model sends me an email with candidate stocks where the RSI is above 70 or below 30, and I would pick from that list likely candidates and record it in a spreadsheet. An important point: Anytime I try out a new strategy I do it via ‘paper trades’ first – instead of actually making the trade, I just write it down or put it in a spreadsheet. I figure if I stumble across a winning strategy, it will work for years to come so I can afford to wait awhile before I actually put it in place. Since I tend to stumble across more losing strategies than winning strategies, this practice has served me well over the years. In a word.. Ouch! Had I actually pursued this strategy it would of been brutal. Note that for calls I sold (those were hypothetical covered calls), my profit calculations include the opportunity cost. 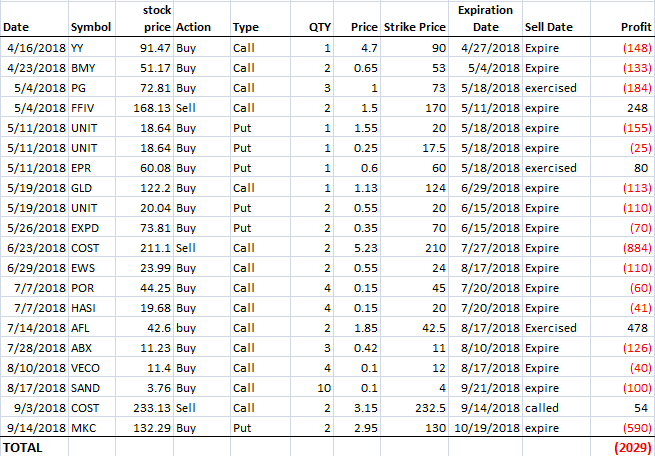 For instance, for the June 23rd sell of Costco calls I would of collected $1000+, but at time of expiration the stock was $884 over the strike price + call price, so I missed out on that (assuming I had the stock to begin with). For now, I have set this strategy aside, and am going to think about what I learned for a few months. Maybe I stumbled upon a successful strategy by doing the opposite of what I originally hypothesized. Perhaps anytime a stock goes above the 10 day RSI, you should buy, and when it goes below sell a call on it. Or maybe the time premium of options just makes it too hard to be successful. I don’t know. What I did reinforce for sure is the value of practicing via paper trades before committing to a strategy.